Hundreds gathered in Gangyal to watch him and the 'baraat' -- the wedding party from the groom's side take off from a specially set up helipad in what turned into a gala media event. Jammu: A would-be groom got off to a flying start today when he left his village in a helicopter to get married in the border stretch of RS Pura. "It was my dream to take my 'baraat' in a helicopter. And now I want to bring my bride home in a helicopter," Anil Kumar told reporters. Mr Kumar was accompanied by three members of his family in the chopper. The bride belongs to Kotli in RS Pura. Mr Kumar, who runs a mobile phone business in Gangyal, said he would return with his bride in the chopper tomorrow. The helicopter made several trips today to ferry members of the groom's family from Gangyal to R S Pura. Mr Kumar's father Madan Lal said not just his son's desire, his own wish, too, had been fulfilled. "I always wanted to take my sons' 'baraats' in a helicopter. I couldn't do so in the case of my elder son a few years ago because I didn't get permission from the government," Mr Lal said. But this time he was successful, he added. "I got the necessary permission and clearance from the district authorities," he said. Lal said he had hired the helicopter at a cost of Rs 70,000 an hour. Hundreds turned up to witness the unusual wedding party take off from the village. 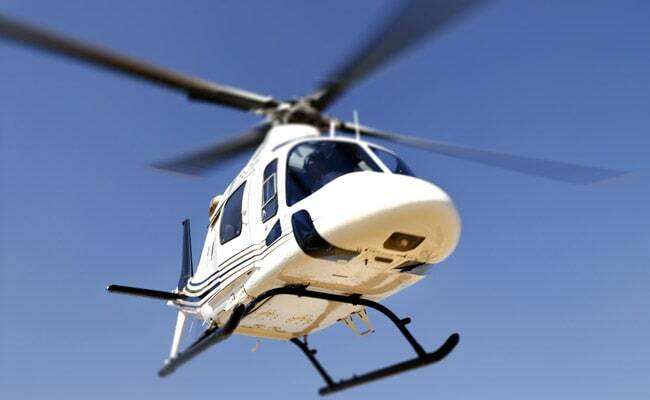 "We are very happy that our area in Jammu and Kashmir has set a record by our young man going to get his bride in a helicopter," Shamsher Singh, a resident of the area, said.